So, what do you get when you put three Canadian rowers, one German rower (who speaks English and is new to rowing) and one French citizen who speaks ZERO English but has been rowing for decades all into an old Dutch wooden quad and let them row in the 44th Annual Vogalonga in Venice, Italy? You get a great story that legends are made of. On Sunday, May 20th, 2018, Shawna Pereira, Shelagh Baker and CK Andrade met up in Venice, Italy to row in the 44th Annual Vogalonga. The Vogalonga is rich in history and spirit. 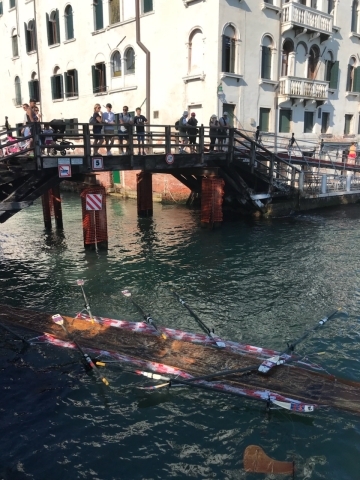 Originally, it started off as a protest by non-motorized boat owners who had had enough of wakes and fast speeds in and out of the canals of Venice by speed boats and motorized water taxis. In true European fashion, fed up boat owners descended upon St. Marks Place in their non-motorized boats and an annual regatta was born. The Vogalonga is held on the third weekend in May and covers a distance of approximately 35 kilometres. Did I mention that approximately 2,000 boats participate in the event? So back to our boat story.....we now have an international crew of three Canadians, one German and one French citizen. We had never met before and our rowing styles were all a little different, but with attitudes and enthusiasm high, we set out to take on the day. Our bib number was 1912 (to be noted the year the Titanic sank). Once in the boat, we quickly set off to the start of the race. Shawna Pereira started as coxie, with a plan to switch out during the day. Navigating through the tight (and busy) canals of Venice was a bit of a challenge but there were no major incidents to report at our on-water switch stop. Now in command was Hanlan's own Shelagh Baker. Shelagh guided the boat safely though the waters around the Venetian islands. At out next switch over, CK Andrade took on the coxie seat, for her second time ever. With confidence and ease, CK guided the boat though the next leg of the row. At some point our German teammate made it known that she was not comfortable navigating our quad, and since our French teammate was in first seat, it was decided that CK would coxie the remainder of the course. So, we row and row and row. The sun is hot and beating down on all participants. As we approach the end of the course we are faced with the "hurry up and wait" scenario. Meaning 2,000 non-motorized boats have all converged at the mouth of the main canal at one time. And we are taking all sorts of non-motorized boats -- canoes, kayaks, paddle boards, gondolas, sculling boats, stand-up crazy peddling concoctions -- if it could float and it was non-motorized it was there ready to enter the main canal towards the finish line. The beauty of the Vogalonga is the madness of the waiting to enter the canal. It's sheer controlled chaos. Boats so close, you could easily walk from floating boat to floating boat. Oars! Oars in ribs, oars in other boats, oars in your face. All of this madness was taken with a grain of salt by participants and the air was light and easy going as we all waited patiently for our turn to enter the mouth of the main canal. Once we were in the canal, it was a straight row to the end of the course. Along the way, people were clapping, drinking, cheering, drinking and clapping us onto the end. Finally....after about eight hours in our quad we reach the finish line. As per protocol, you line up your boat in front of the medal tents. Packages of medals and certificates are thrown into your boat and back you go to row your boat BACK to where you initially launched. So, at this point our crew had a decision to make. Take the DVP (the main canal, now open to regular boat traffic) back, to drop and de-rig the boat. OR…take Leslie Street (the outside channel around the Island of Venice) to take the boat back and de-rig. After a lot of back and forth in the boat, it was decided to take the channel home. We saw other boats taking the channel route, but what we didn't know was exactly how wavy and open the water was. As we slowly inched our way towards our boat drop, we were constantly battling high waves and whitecaps. There was a lot of back-and-forth discussion as to what our next step was going to be when suddenly we all heard "you can stop talking as we are going DOWN." Within two seconds, a giant wave swamped our boat and all of a sudden, the beautiful wooden quad that we spent the entire day rowing in was now under water. It didn't take long for people to act. Our German crew mate immediately inflated her life jacket and abandoned ship. She swam safely to shore and waited our arrival. The remaining crew managed to flag down a speed boat that picked up our French rower, however not before he swam back to pick up our participation medals that he left in our sinking ship. The Canadians representing Hanlan stayed with the boat that was eventually towed into shore by Marine Rescue. Once on dry land we were then approached for our passports and information. The Harbour Master needed to file a report for the live rescue and the fact our sunken boat was now blocking a canal (or, in the way Venice works, a road). So in the end, everything worked out. People were rescued, everyone was okay and no one was hurt. Our boat was salvaged, de-rigged and was sent back to Holland to assess the damage. We have yet to hear back as to what our damage owing really is. And, most importantly, thanks to our French rower, we have our medals and proof that we actually finished the 44th Annual Vogalonga. Now that the story is at its end, we can say that adventure was had and that we now have a story worthy of sharing with a little advice to go along with it. Even if your boat number is 1912, the year the Titanic sank, all you can do is laugh and appreciate that adventures in rowing are priceless.